At this year’s AONE Conference, over 2,600 nurse leaders will meet in San Diego to share learnings as we advance the culture of nursing excellence together. Over the course of my 25-year career, I’ve found AONE to be a great opportunity to reflect upon the accomplishments of the profession and our impact on the future of health and healthcare. Today, nurses are responsible for encouraging patients to live healthier lives and help address needs outside just those that arise at the bedside. 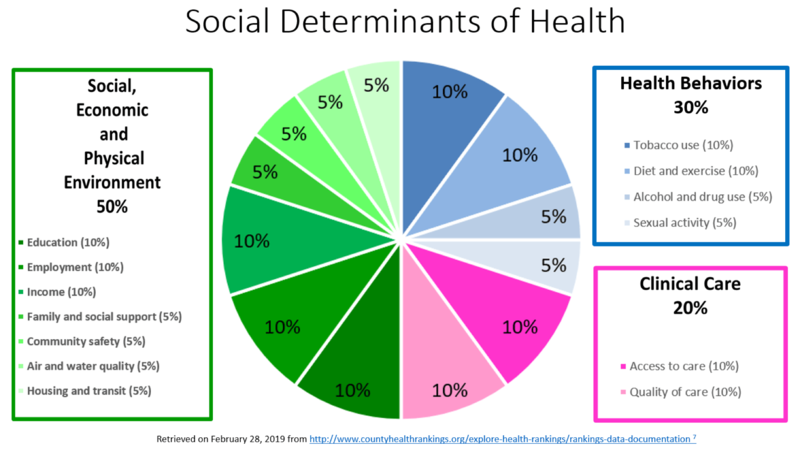 Social Determinants of Health (SDOH) are at the top of everyone’s mind and with that comes the question of who manages this? Florence Nightingale answered this question for us during the Crimean War when she created the first nursing theory, the Environment Theory. Nightingale observed a correlation between patients who died and their environment. There are several assumptions made in the Environment Theory, which focuses on taking care of the patient’s environment in order to reach health goals and cure illness. The focus on nursing in this model is to alter the patient’s environment in order to affect change in his or her health. Nightingale believed that a patient may experience diminished health if fresh air, pure water, adequate food supplies, cleanliness of the patient and environment, and direct sunlight were lacking. Within the Environment Theory, there are ten major concepts known as Nightingale’s Canons. 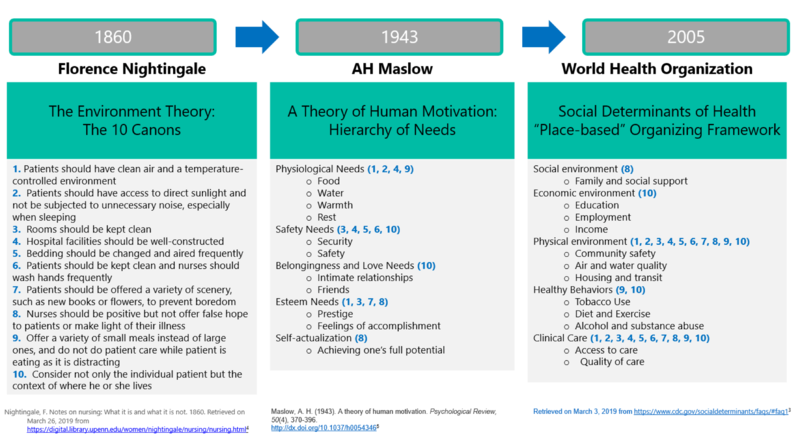 These Canons are so closely aligned with the World Health Organization and Healthy People 2020’s “place-based” organizing framework that one might argue that Nightingale was the founder of the social determinants of health (SDoH). One could also say Nightingale contributed to Maslow’s Theory of Human Motivation and the Hierarchy of Needs. Nightingale is not the only nursing pioneer who impacted the way that we think about and address the social determinants of health today. Jean Watson is another nursing theorist whose work supports the SDoH through Holistic Nursing, the practice of nursing that focuses on the health of the whole person. Watson believed that “a human is viewed as greater than and different from the sum of his or her parts”. Her theory, the Philosophy and Science of Caring, integrates four major concepts: Human being, health, environment/society, and nursing. This is yet another argument that the nursing profession has always managed social determinants. Knowing the impact nursing leaders have had on the theories regarding health, how can nurses today work with members of the larger care team to provide complex care management? Recent research suggests that the largest contributor to health is Social, Economic and Physical Environment (50%) over Health Behaviors (30%) and Clinical Care (20%). The effective management of high-need, high-cost individuals is integral to the success and sustainability of a value-driven health care system. These patients comprise 5% of the population but account for more than 50% of total U.S. health care spend. Complex care management programs coordinate essential services, address critical gaps in communication, and prevent costly, avoidable hospitalizations and other urgent care services. By coordinating with community-based resources and care team members across the continuum, nurses have the ability to address issues that impact the whole person, not just the patient. As healthcare shifts towards value-based incentives, there is more possibility for nurse leaders to tackle SDoH. Over time, as nurses continue to play this critical role, the health of our population will benefit greatly. Nurses use human touch to show that they care for a person when they are within the four walls of an organization. Moving beyond the bedside can show a person that you care about them when they are no longer under the direct care of providers. Nurses can continue to lead the way in improving the health of our country. As Florence Nightingale famously stated, “The goal of nursing is to put the patient in the best condition for nature to act upon him”. Kimmie Krakowski, MSN, RN, CENP, CAHIMS is the Chief Nursing Information Officer at CipherHealth. Prior to her current role at CipherHealth, Krakowski served as the Associate Chief Nursing Information Officer, Senior Director of Informatics and Innovation at Inova Health System. Krakowski recently published Exploration of Portal Activation by Patients in a Healthcare System and co-authored An Introduction to Nursing Informatics, Evolution, and Innovation and An Introduction to Nursing Informatics, Evolution, and Innovation, 2nd Edition (available in November 2018). Krakowski is also featured in Build an A Team by Whitney Johnson.